Many applications are vulnerable to intrusion attacks and can provide misleading reports about misbehaving nodes. Some of the mechanisms under such a category include the Bayesian fault recognition algorithm which relies on the spatial relationship of environmental conditions. 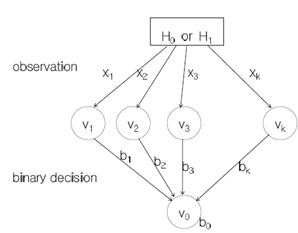 Other schemes which have been tried but failed include the autoregression technique which relies on the strength of the signal transmitting data, the network voting algorithm, and the weighted trust evaluation based on trust levels on a hierarchical network. All the above mechanisms have suffered various weaknesses when used in WSN. The mechanisms integrated into the WSN network with triple key management scheme to provide a complete secure network uses a Dual Threshold. In this context, α1 and α2 defined with appropriate trust values are used. The mechanism has been proven to provide enhanced node detection performance. The mechanism operates by enabling each sensor node in the wireless network to have trust values updated each time an event occurs to provide the correct report. A study by Lazos and Poovendran shows that the weighted graph illustrated above shows that weight wij, has values that range between 0 and 1 etc. A typical example where wij =1. Here, Lazos and Poovendran show that the corresponding nodes have trust value is vj as shown above. On the other hand, when the value of wij is equal to zero, there is no trust value and a flag Fi is set to 1. The node is faulty. 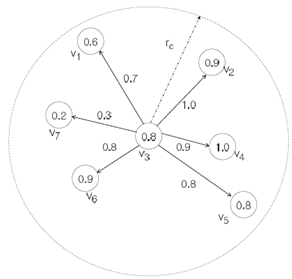 Detections can be based on distributed events based on the dual threshold technique. As mentioned above, there are two thresholds, α1 and α2; with α1 being used to detect an event while ensuring a low false alarm rate exists. On the other hand, the threshold α2 helps nodes that are on or near the boundary region of an event to pass the test reflecting accurately the level of detection as illustrated in figure 4 below.